Author HoneyPosted on April 22, 2011 May 24, 2017 Categories Honey's Hive9 Comments on Lets go Again! It was great seeing me…. I would like to take this opportunity to thank all my fans that gathered to have a visit with me. 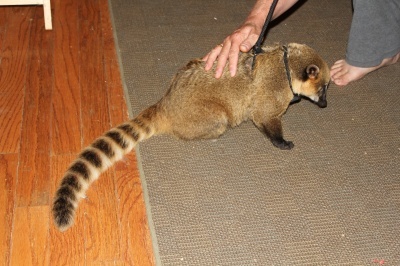 It was wonderful that you assembled this pet fair to give all the little people a chance to meet me and my CoatiDaddy. I had a wonderful time showing myself off. 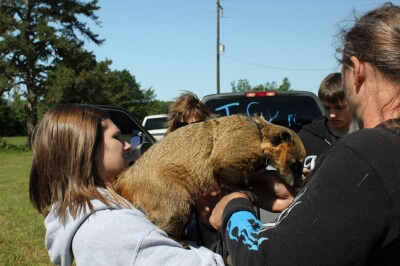 With CoatiDaddy as a personal bodyguard I felt safe and secure. 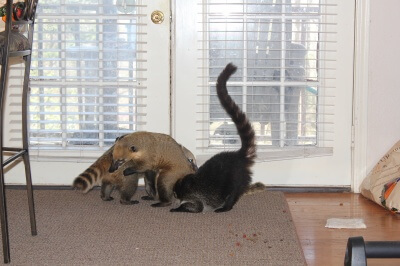 I am not really sure why all the other animals were there or why CoatiMom brought Thorn the Puppy. I guess they wanted to get a look at me too. It was an interesting day. Honey has now left the building…….. I am proud to say, tomorrow I will be the public ambassador for the Coatikids! 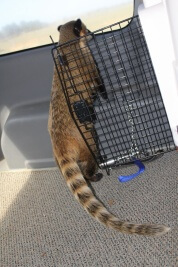 CoatiMom and CoatiDaddy are taking me to a pet fair for children and other humans to see me. 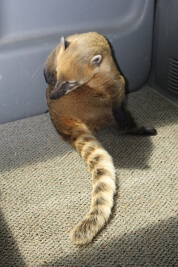 Before I can go, CoatiDaddy first gave me a bath. 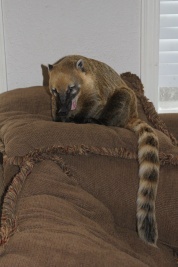 I hate baths, but I’m over it and I do smell nice and fresh from the baby shampoo CoatiMom used. Things where all good and I was enjoying some evening snacks. 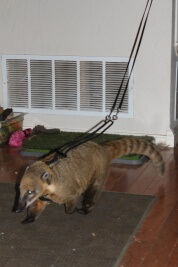 (something new called a fruit roll-up, and it was very tasty) Then he did it, Coatidaddy got this torture device out and proceeded to wrap it around me and I was not happy about that……..P.O.’ed is more like it. Well he made me wear this silly thing and I guess it’s not to bad. 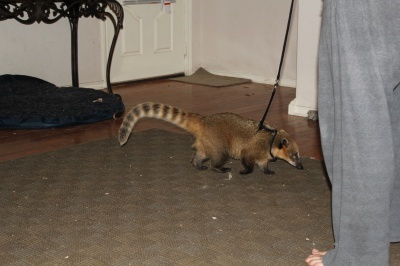 I really didn’t like it at first, but I got pretty good and followed CoatiDaddy especially since he tied a rope to the end of this thing and lead me around the house…After all what did he think….. I was a dog or something?? ?….I’ll let you know how tomorrow works out, since this is my first time to do anything like this. 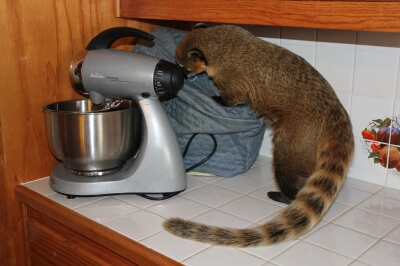 After all, I guess these public appearances are my job has the new Matriarch of Coati Cottage…. I know CoatiMom left this out for me cuz she likes me best. This chow is da bomb! 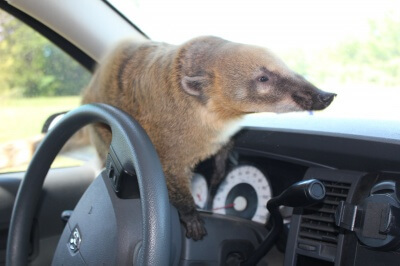 I may be the new kid on the block but those other coatikids don’t have nothing on me. I had to teach ole Clyde a few manners, give Lucky a personality boost (and something to do besides eat) and bring Raven out of her shy shell and put a lid on bossy Bonnie. 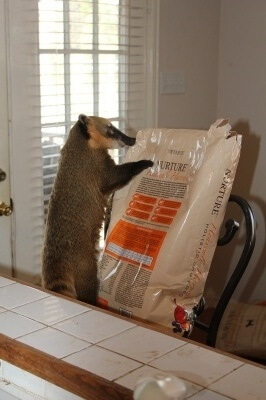 CoatiMom loves to reward me, I get special treats just for me and this must be one..Pardon me can someone poor me a dish? My China saucer is on the counter. Oh please use the one with the gold trim on it… it’s my favorite, Thank you. Yummies for my pretty Tummy!! 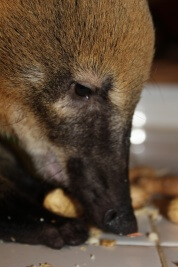 Nom Nom Nom…crunch crunch crunch! I really can’t decide what I like more. 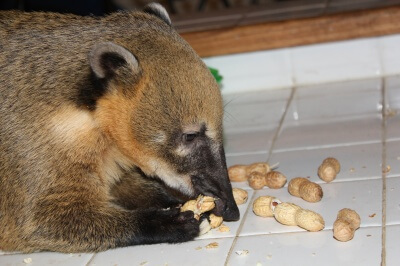 Peanuts are awesome, they are like a toy/treat all in one! I get to play with them and make big piles of shells and then scatter them all over! What fun……. 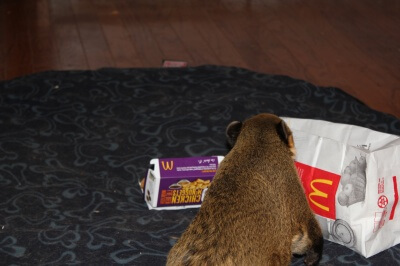 CoatiMom really rocks, she went to Mc Donald’s just to get me some chicken nuggets because Mommie Sarah was thoughtful enough to send her a list of my favorite treats…It’s good to be me!!!! My First Day…The Scratch and Sniff Test…. My first day started off great! 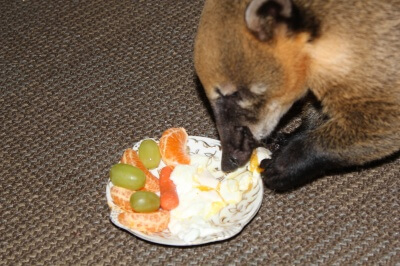 My New CoatiMom served me an egg (over easy, I hope she learns I like them raw) and some grapes, carrots, tangerines and some breakfast cereal bar. 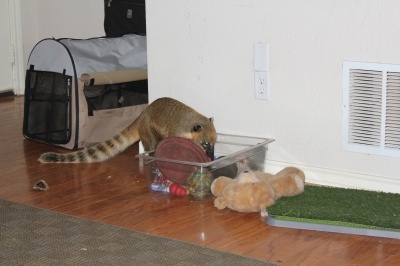 I was chillin… exploring the toy box and rooms with counter tops. Then out of the blue this little girl darted out. They call her Raven. Raven is different from me and she scared me! 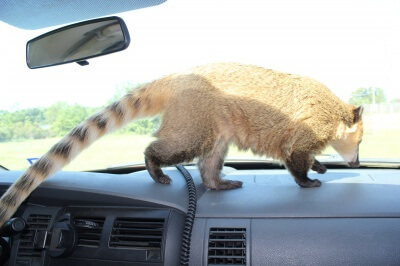 CoatiMom quickly scooped her up. Then along came this goofy little boy they call Clyde. 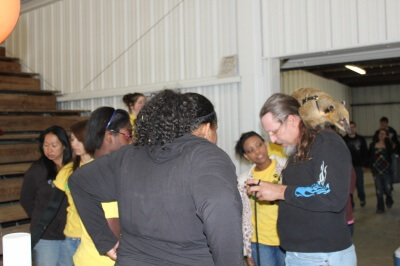 He kinda looked at me then went on with his busy business and I went on with mine….Then all of a sudden I was invaded! The scratch and sniff test was on! 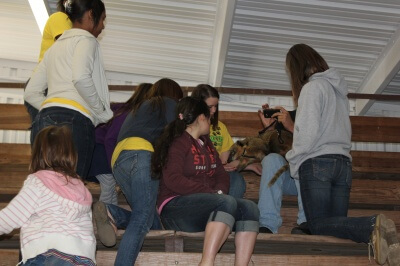 It was the most fun…There turned out to be some really cool Coatikids here to play with( two boys and two girls, Lucky, Clyde, Bonnie and Raven). I think I am gonna like it here! 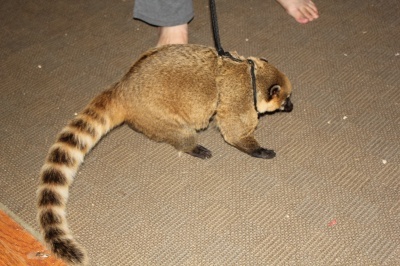 I just hope the other girls don’t get jealous of me, cuz I am the prettiest with my beautiful long tail and thick soft fur. I know the boys already like me…*winks* After all I know how to eat off of fine China and drink out of China tea cups. ( Mommie Sarah taught me that) The secret is to sip ones water and not gulp! Clyde is very cute but he has the table manners of a big ole oinky pig. Maybe some of my good manners with rub off on him. 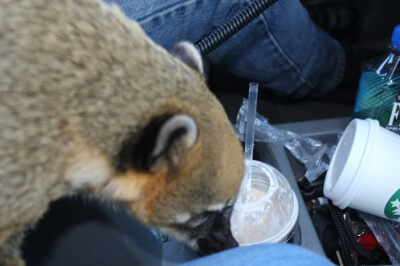 CoatiMom is super impressed that I can keep my tea cup with me when I sleep and not spill it. She really likes me, I can tell. 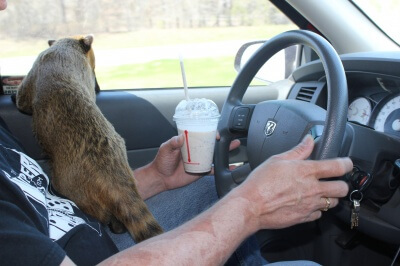 CoatiDaddy is a pretty awesome dude. He picks me up and talks to me, pets me and I love to snuggle with him and sleep on his lap when we watch TV…I see many happy days in my future. Author HoneyPosted on March 12, 2011 May 24, 2017 Categories Honey's Hive1 Comment on My First Day…The Scratch and Sniff Test….